Zenburn is a low-contrast color scheme for Vim. It's easy for your eyes and designed to keep you in the zone for long programming sessions. The purpose is to collect links to various ports for different utilities and environments and, of course, show a screenshot! Nowadays Zenburn lives at Github. To use Zenburn in GVim, simply copy the file to colors/ subdirectory under your Vim configuration folder (e.g. \~/.vim/colors or C:\vim\colors). To use Zenburn in Vim, you must enable the 256-color mode for Vim. This can be done with e.g. export TERM=xterm-256color. You might also need to add set t_Co=256 into your .vimrc file, before loading the colorscheme. Note, that due to limitations of the 256-color mode the color scheme is not exactly like it appears in GVim, but very close nevertheless. Have a look at Darmawan's page for further information and screenshots. Note: Some links are broken! Zenburn for KDE konsole by Christoffer Sawicki. See also below for Konsole 2.0. Daniel Brockman had a page with many adaptations (Link dead). Daniel's Emacs version still exists at Github. Jakub Piotr Cłapa Zenburnt his entire desktop! Zenburn ported to Notepad++ by Dominykas Djačenka. SubEthaEdit Zenburn by Henrik Bergius. "Dark Zenburn Global Style" for Stylish browser plugin. Zenburn for KDevelop/Kate by Lukasz "Lookanio" Purgal. Zenburn for KDE3 by Kevin Geiss. Putty colors by Steve T.
Marc Kerbiquet uses Zenburn in his Code Browser software. Andrew Janke did a Zenburn-configuration file for Gnome Terminal. See also his comment below. Jonathan Bonomo made a color scheme for sterjm (project page). You can download the file here. Hisham made a Typo/CSS Zenburn theme. Juhapekka Tolvanen made a Zenburn config for ctheme. Zenburn for Konsole redux by Craig. It's for Konsole 2.0 (KDE4). Apologies to Craig since I had somehow overlooked his link from the old page. Zenburn Blogger template with syntax highlighting for code examples, by Elijahr. "Zenburn-like color scheme with terminus/proggyclean fonts for terminals and emacs." Cheers to Nick C for pointing it out. Windows cmd.exe port (also for Powershell) by Twinside. Adrian C has a whole bunch of Zenburn things, including a Zenburn theme for the Awesome WM - have a look at the simply excellent screenshots! You can read Adrian's journal entry too. Abchernin sent information about how to set up for EasyEclipse for Python 1.3.1. Gianfranco did Zenburn for SciTE v1.78. Gimp palette by an anonymous contributor. It was cool to see all the colours in one place. David Beckingsale made a Sandbox derived theme with Zenburn colors, called ZenSandBox. 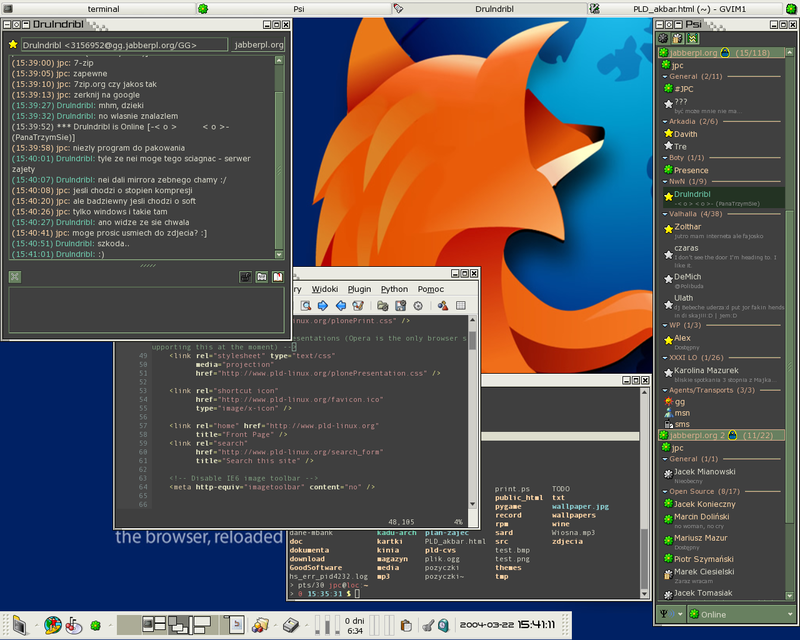 Pietra Arumaga has goodies for MacVim and Komodo users: "MacVim as IDE with Code Completion and Syntax Highlighting for Python, PyQt4 and Twisted Development on Mac OSX Snow Leopard" and Zenburn zip for Komodo Edit/IDE. Bozhidar Batsov did an Emacs port of Zenburn. Not a rewrite of Daniel Brockman's version. The zenburn-emacs is at Github. He also ported Zenburn to the Jekyll static site generator for Ruby, you can get the css for Jekyll here. Dale Anson brings Zenburn to the Lipstik look and feel, as well as a jEdit port. Alper Buluc did a Zenburn port to the PHP IDE PhpStorm. Zenburn for PhpStorm at Github. Benjamin Esham's Zenburn for Mac OS X built-in terminal link was dead for a time, but is available at Github, zenburn-terminal. For more links, see the comments below. See also the contribs-branch of Zenburn at Github. If you have made a new port, please drop a comment. Thank you for enjoying "Just some alien fruit salad to keep you in the zone"!